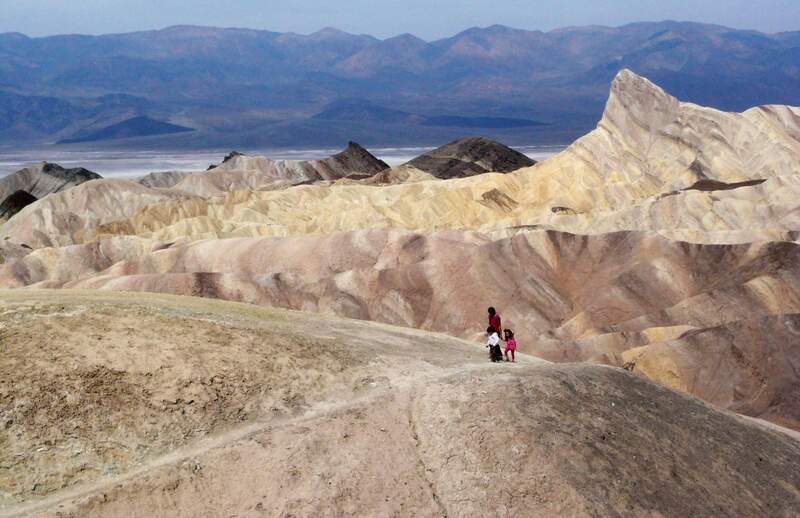 Tourists walk along a ridge at Death Valley National Park, Calif. Preliminary data show that Death Valley set the world record for hottest month in July 2018. National Weather Service meteorologist Todd Lericos says the month’s average temperature at Furnace Creek in Death Valley was 108.1 degrees Fahrenheit. That eclipses the previous record, set in Death Valley during July 2017 when the average was 107.4 degrees. LOS ANGELES – The natural furnace of California’s Death Valley was on full broil in July, tentatively setting a world record for hottest month ever. The month’s average temperature was 108.1 degrees, said Todd Lericos, a meteorologist in the Las Vegas office of the National Weather Service. That roasted the previous record, set in Death Valley in July 2017 when the average was 107.4 degrees. The temperatures are measured at Furnace Creek in Death Valley National Park, a vast, austere and rugged landscape in the desert of southeastern California that includes Badwater Basin, which at 282 feet below sea level is the lowest point in North America. The location holds the world record for highest temperature ever recorded – 134 degrees – set on July 10, 1913. Among the extreme conditions were four consecutive days reaching a high of 127 degrees and overnight lows that remained over the century mark.